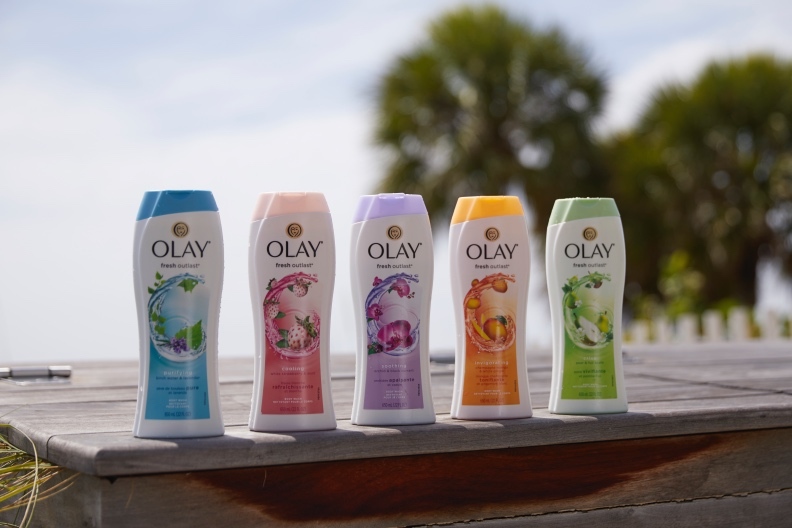 I was invited by Olay to try out their new line and learn a little more about women shower interests and shower habits. To be honest, I really identified with the scents. I am one of the ones that can’t start my day without a shower more than to clean myself it refreshes me and for me, it’s the best place to brainstorm! Yes, many of my creative ideas come when I’m in the shower. Being a working mom and always being on the go, shower time is relaxing time for me. It’s a moment to breathe and let go of all the craziness of the day. After spending the morning at the beach followed by a refreshing shower and a sun bath, I felt happier and energized! I know it’s not always easy to have an outdoor shower but if you get the chance go for it! Olay carries an array of Fresh Outlast Body Washes to enjoy and get you in the mood to start or finish your day. 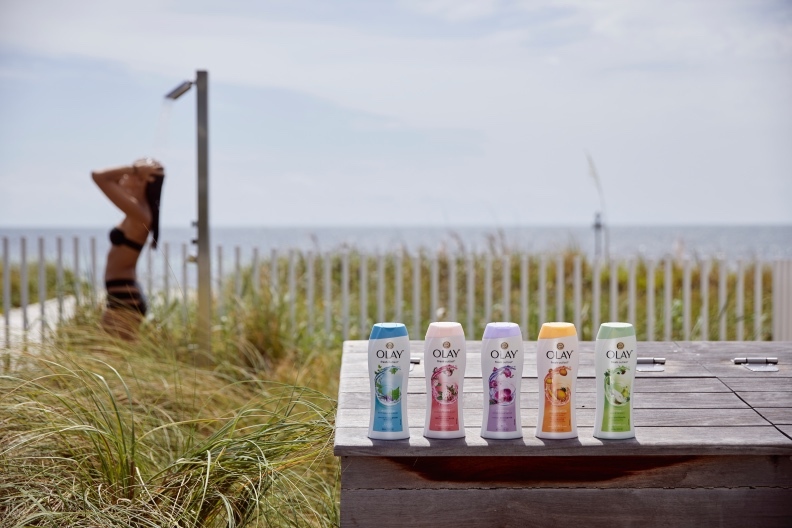 I love smells that are fresh, and a bit fruity, Olay scents are great, my favorite one was “The Quality Seeker” Invigorating Champagne & White Mango Body Wash, love scents that give you an energy kick and for summer days I recommend the Cooling White Strawberry & Mint Fresh Scent. Go to OlayScentPersona.com and find your scent. Go to www.OlayScentPersona.com and see what’s your Scent. Fui Invitada a probar la nueva línea de Olay y así enterarme también un poco más sobre cuáles son los hábitos de baño que tenemos nosotras las mujeres. Para ser honesta, me sentí súper identificada con sus fragancias. Yo soy de las personas que no puede comenzar su día sin primero tomar una ducha, no solamente para limpiarme y refrescarme, ¡también me parece que es el mejor lugar para meditar! Si, muchas de mis ideas más creativas se me ocurren mientras tomo una ducha. Siendo una mamá trabajadora y siempre “On The Go”, el momento en el que tomó la ducha es muy relajante e importante para mí, es un rato para respirar y dejar ir todo el stress. Me sentí súper fresca y energética después de pasar una mañana en la playa. Sé que no siempre es fácil tomar una ducha al aire libre, pero si tienen la oportunidad, ¡no la pierdan! Olay tiene una excelente colección de jabones de baño para ponerte de humor sea para comenzar o para terminar tu día. Me encantan los olores que son refrescantes y un poco afrutados. ¡Las fragancias de Olay son espectaculares! Mis favoritos fueron: “The Quality Seeker” Invigorating Champagne & White Mango Body wash, me encantan las fragancias que te refrescan rápido y para estos días calurosos de verano les recomiendo Cooling White Strawberry & Mint Fresh Scent. Vayan a www.OlayScentPersona.com para que encuentre su fragancia.